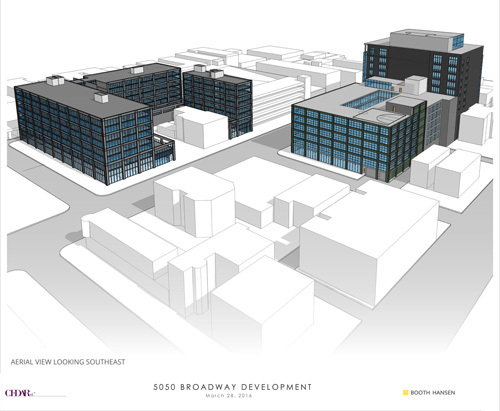 "On Monday night, we had a positive community meeting about Cedar Street's planned redevelopment of the former Aon building, 5050 N. Broadway, and nearby properties. We will follow up with another community meeting in late April or early May. In the meantime, please feel free to send any feedback or questions about this development to info@cedarst.com." UU Note: This project involves properties in both the 47th and 48th Wards, with Broadway being the ward boundary. I'll be really excited to see the ground floor developed into anything other then the angry Soviet Russia facade that's there now. This will be great--GREAT!--for the neighborhood. Let's get it built. Now, I wish someone would acquire the old Schlitz tied bar at the corner of Broadway and Winona, give it the TLC it so badly needs (including restoration of the Schlitz medallion high up on the Broadway side), and reopen it as an upscale bar/eatery.